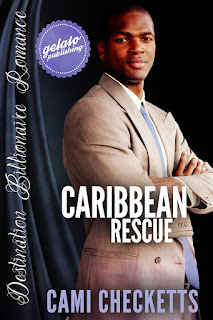 Just in time for the Summer Olympics, bestselling sweet romance author, Cami Checketts, brings you a new Destination Billionaire Romance. Superstar runner Zack Tyndale was the easy favorite to win gold in the Olympic Games, but a stupid decision shatters his dreams the night before the big race. Unable to face his shame, he escapes to the Caribbean and a life of blissful solitude ... until Madeline Panetto crash lands on his pristine private beach, trying to outrun a gang of pirates with nothing but a fancy evening gown and a flash drive hidden in her bra. Zack finds himself sucked into Maddy's world of mutiny and murder. Madeline might find refuge from the pirates, but Zach is battling pirates of his own. When sparks fly between them, they're forced to look to their hearts for the answers and that could be more frightening than facing a mutinous crew. A few steps from the French doors he heard the high whine of a motor. Zack whipped around and searched the ocean beyond. There were no lights, but the motor sound was unmistakable. What kind of an idiot would be out on the water with no lights on and in what sounded like a small boat? Zack raced past his pool and gardens, and took the steps to the beach two at a time. He could just make out a small boat, hurtling through the water. He didn’t even have time to be angry someone was invading his sanctuary as he saw the angle they were coming at. “No, not that way!” he yelled, though they couldn’t possibly hear him. Zack sprinted through the sand and onto his dock. He kept one eye on the boat as he ran the length of the dock, waving his arms and yelling, “Turn! Turn!” Large boulders and a former shipwreck resided just under the water, exactly where that boat was heading. Any other angle into the harbor was deep and safe to take even in his yacht, but this idiot was coming straight for the shallow waters of the dock instead. Why weren’t they slowing even though they were within a hundred feet of the dock? The sickening crunch was louder than the howling wind and rain. The rear of the boat flung into the air, and the lone passenger flew forward then disappeared into the water. Zack dove off the dock, surfacing quickly, and using strong strokes to cross the distance. Water from the uneven waves splashed into his face, making it hard to see. The person bobbed up out of the water and started swimming his direction. That was a relief. From the hair streaming around her, he assumed it was a woman. “Can you make it to the dock?” His lights reflecting from the beach showed a mop of dark hair and a beautiful face. In answer, she started slowly swimming that direction, but she hadn’t gone four strokes before she swayed and rolled over onto her back. That’s when Zack noticed the cut on her head. The water turned the blood a watery pink. She’d definitely hit her head on one of the rocks or maybe the old shipwreck. “I can make it.” She started to kick. A wave rolled over her face and she jerked up, coughing and spluttering, but bravely kept trying to stay afloat, beating at the water with her arms and legs. She was tough and not a complainer. Nice. “Saint Peter?” She’d hit her head hard or she was crazy. He looked over her fancy, waterlogged dress and the diamonds sparkling at her throat. She’d been out in the ocean like that, without a lifejacket? Crazy it might be, or with quite a good story to tell. She placed her hand in his, but wavered as he helped her up. Zack wrapped his other arm around her waist and lifted her onto her feet. She swayed. She pulled away from him, took one step, teetered off the dock, and splashed back into the water. “Oh, boy.” Zack shook his head. He hadn’t smelled alcohol on her breath, but that had to be the explanation. Fancy dress, alone on a boat in the ocean at night. He’d have to help her tonight then load her onto his yacht tomorrow and get her to Belize. If she had any money it was probably sunk with her little boat. He’d get her to where she needed to go and be done with this mess. Oddly enough, he didn’t mind the excitement. It was a good contrast to his normally sedate lifestyle. Her head whipped up. Brown eyes full of fire. “I’m not drunk, if that’s what you’re thinking, I’m…” She quickly looked down again, not meeting his gaze. “You’re…” he encouraged. He’d like to hear her story and he did believe her that she wasn’t drunk. Her speech was too lucid and her breath smelled too clean. Zack jerked in surprise and almost dropped her as she squirmed in his arms. “What are you doing now? You want to fall in the water again?” They’d reached the end of the dock, but she could still fall in the shallow water. “I’ve got to find something. Please. Can you help me look in the water? Back where my boat is?” Her eyes were wide and frantic. “Right now?” Zack gestured to the waves building as the storm increased in intensity. “No! You’re hurt. It’s dark. And there’s a storm.” His four-year-old niece had more common sense than this woman, and Chalise hadn’t spoken a word in two years. The woman deflated and burrowed herself into his arms. Zack liked this quite a bit better than her struggling. He tightened his hold on her. Hmm, her shape was really… shapely.